There’s a lot of American Film Market (AFM) craziness on the way with announcements, confirmations, first images and synopses from plenty of upcoming films. The Expendables 3 has looked like it’s pretty much a go since August, and a flyer from Nu Media/Millennium Films has confirmed that the studios are selling the international distribution rights, which will likely help fund the upcoming action flick. 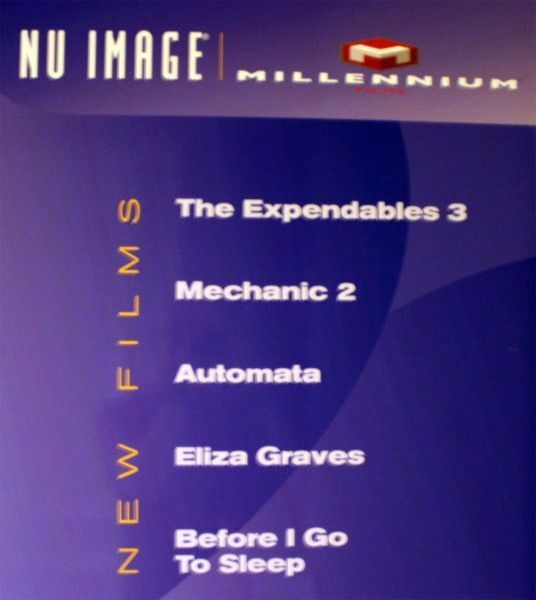 A more surprising announcement is that Nu Media/Millennium Films are planning The Mechanic 2, a sequel to the 2011 action flick about a hitman (Jason Statham) and his protégé (Ben Foster). We have absolutely no details on the plot for either sequel, but The Mechanic 2 is a bit of a surprise since the original flopped at the box office. We’ll be sure to bring you any updates on both projects as we get them. Hit the jump for a full look at the flyer, which also includes Nu Media/Millennium Films’ non-sequels.